Please note that information such as paper titles, authorship and precise times may vary in the final programme. DAY 1: Tuesday 20th October 2015. 10.30 – 11.00 Opening Address: Setting the Scene (Looking Back to 2004). 11.00 – 11.30 Genetic Basis of Anadromy in brown trout. What we know and what we need to find out. Understanding anadromy as an individual adaptive behaviour. Theory and its consequences. Are lakeward migrations conceptually different from anadromy in trout? Influence of seascape and migratory patterns of coastal brown trout genetic structure. 12.40 – 13.00 General Discussion. Population structure and mixed stock analysis of freshwater trout/sea trout: where we are and where we need to go. Spatial and temporal variation in sea trout abundance and life histories in the Irish Sea. Derivation of catch & stock based Biological Reference Points for sea trout in E&W. A comparison of methods and critical examination of their potential application to stock assessment & Management. Ian Davidson & Miran Aprahamian. The development of a biologically based management system for sea trout on the Shimna River, Northern Ireland. Sea Trout angling exploitation rates from Irish Fisheries monitored by fish counters. The relative importance of sea trout & salmon to the recreational fisheries in England & Wales. Robert Evans & Graeme Harris. Welcome Drinks Reception & Poster Displays. DAY 2: Wednesday 21st October 2015. Movements of sea trout in the coastal waters of Great Britain. Hydrodynamic modelling of sea trout movements in the Irish & Celtic Seas. Genetic structure & acoustic tracking of sea trout (Salmo trutta L) in the Rhine & Maas estuary in the Netherlands. Downstream migration, mortality, migratory routes and habitat use of sea trout at sea. Marine migration & habitat use of sea trout Salmo trutta L. In a fjord in central Norway. Marine migrations & loss rates of sea trout smolts in the freshwater/sea water transitional zone. Use of genetic data to elucidate sea trout movements in southern British Waters. Tracing origins and movement patterns of Salmo trutta in the Irish Sea using otolith microchemistry. Swimming depths of sea trout in coastal waters. A comparison of movements of sea trout emigrating from two adjacent rivers in Loch Linnhe. Sea trout migrations promote interbasin connectivity between populations. Marine feeding of sea trout in the Irish Sea. Migration behaviour of sexually immature and mature sea trout in a large subarctic river system: evidence of a two season spawning migration. Use of stable isotopes to assess the distribution of reproduction by migratory and non-migratory trout within river systems. DAY 3. Thursday 22nd October 2015. Assessment of status of Baltic sea trout populations. 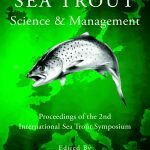 Scandinavian perspectives on sea trout stocks: monitoring, threats & management. Observations on sea trout stock & fishery performance on the Rivers Dee, Tamar, Lune & Tyne, 1991-2014. Contribution of Index River Monitoring in England & Wales to fisheries management. A critical review of the methodologies for obtaining sea trout & salmon catch statistics for the rod and net fisheries in the British Isles. Graeme Harris & Robert Evans. Ted Potter & Nigel Milner. Sea lice impacts from salmon farming on sea trout: a review of recent developments in Ireland, Scotland & Norway. Sea trout and tidal power: challenges and approaches. Acoustic tracking study of the migration behaviour of sea trout around a co-located Larinier fish pass and low-head hydropower turbine on Ruswarp Weir at the tidal limit of the Yorkshire Esk. The behaviour of wild sea trout smolts in relation to a small in-river hydropower scheme.